Holiday Cookie Swap Blogging Adventure! 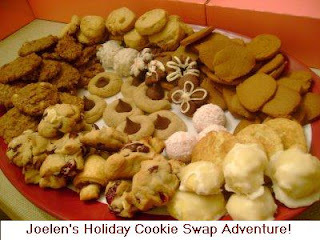 In honor of my annual Holiday Cookie Swap this year, I'm hosting a Holiday Cookie Swap adventure! BLOGGERS: Join in the fun and share a cookie recipe for this blogging adventure! 1) Make a cookie recipe and create a blog post about it from now (the date of this post) until the midnight, December 7th. Any previous blog posts you have where you've created cookie recipe are happily accepted. - Your state and/or country location if outside the U.S.